Breakfast available, pay at the propertyBreakfast is offered for an extra charge of EUR 15 per person (approximately). For bookings of 6 rooms or more, this property requires full payment for the stay at time of booking. Payments are nonrefundable. For more details, please contact the property using the information on the reservation confirmation received after booking. Bussaco Wine Bar - This wine bar specializes in Portuguese cuisine and serves lunch, dinner, and light fare. Nice hotel. Updated some time ago. Friendly staff. Good breakfast. Great location📍if looking to visit some key attractions. Great location. Helpful staff. No tea making facilities in the room which was disappointing. The location couldn’t be better for access to Belém sites. The service is wonderful, and the breakfast buffet had everything anyone could want. Our room was HUGE. My only complaint concerns the state of the hall carpets; they are old, dirty, ugly, and smell of mold. 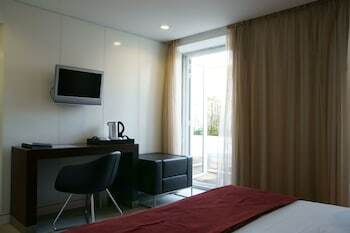 Convenient clean comfortable contemporary hotel well located with a sumptuous breakfast buffet. The room I stayed in was a bit small though. Very attentive staff. Really pleasant area with lots of amenities. Access on public transport to and particularly from lisbon is crowded.